It’s not every day you come across a no-care, nearly evergreen, lush, glossy, emerald green shade plant, but it is a happy day when you do. 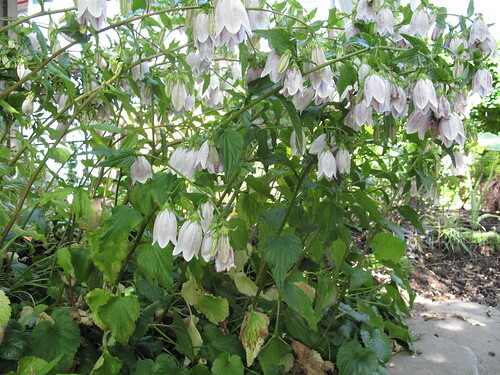 I’ve mentioned in the past that I grow Campanula takesimana for a ground cover, not for its messy flower habits. At the time I only had pictures of the messy part, but now I can show off what it looks like at its best. Most Campanulas are sun plants, but this one likes at least afternoon shade, if not all day shade. I give this plant absolutely no care at all, no supplemental water, although I have read that water helps the flowers, which I cut off anyway, unless I’m intentionally letting it go to seed. In my opinion, the nodding flowers have nothing to do with the plant’s appeal, although they have their charms before they start to make the plant look a little raggedy. > Q: What’s even better than plant shopping at Cistus? Hi Megan~~ I know what you mean. The flowers are like, the quintessential anti-color but ooh, la, la…that foliage, lush and green. I’ve got a purple Campanula something or other that need not even bother with blooming. The foliage is fabulous. I like the little bluish bell shaped flowers. Great stand around that tree. Nice that it is evergreen. Lovely. I think the flowers are kind of cool, but you know how I am with that stuff. I have some other kind of campanula, don’t know the name, but it will grow anywhere and I treat it the same as you treat yours. Nice that they can be so adaptable! Lots of ground to cover around here. Thanks for the recommendation. Sometimes garden blogging is astounding to me. I especially like it when others give advice on a plant. I just (two days ago) planted some of these very campanulas (Bellringer) that came in from Bluestone Perennials. 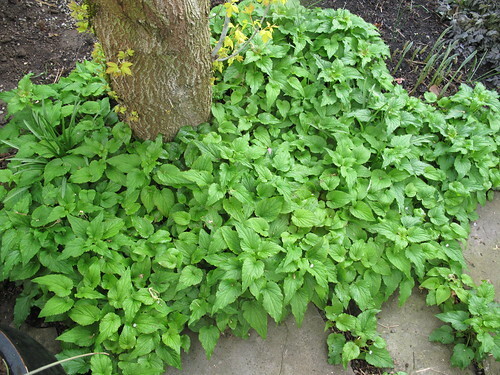 I planted them along side Campanula punctata ‘Cherry Bells”. I sure hope they do well here but the website said they may need extra water here. It really is a pretty little thing and the flowers will just be a bonus. I’d like to see a good groundcover out of mine. I put it in the way back area around a tree stump so it can spread (I hope) or not. So glad you posted this! I feel your pain on the frogs-very exciting indeed to touch when you aren’t expecting it! I’m thinking eek! So glad you can garden in a neighbor’s yard. What fun!